This policy aims to enable the College to respond to bullying in a timely and effective manner that promotes healthier social behaviour between students, both face-to-face and in the online world. 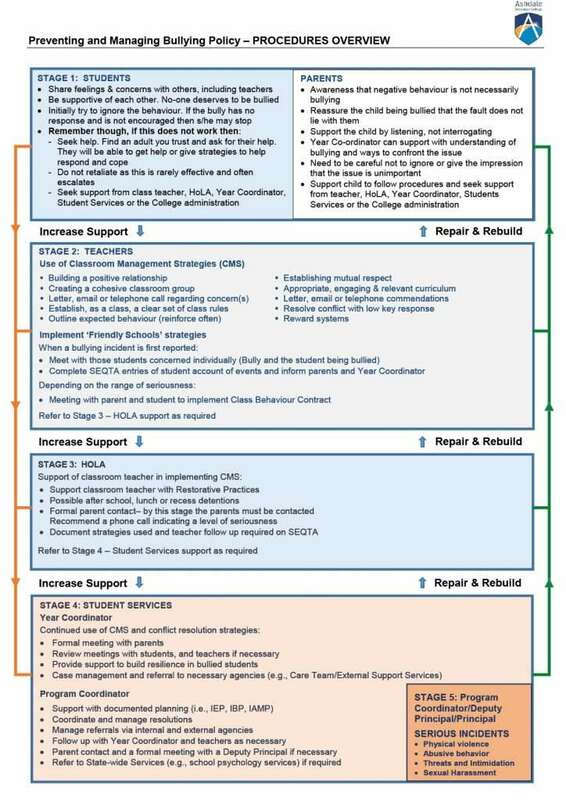 Teachers, students and parents are aware of the College’s processes for responding to bullying. Students who report bullying feel supported. Students have strategies to improve resilience and reduce the need for antisocial behaviour. All members of our College community are committed to ensuring a safe and supportive environment where all members have the right to be respected and have a responsibility to respect each other. Verbal Bullying: The repeated use of words to hurt or humiliate another individual or group. Verbal bullying includes, for example, using put-downs, insulting language, name-calling, swearing, nasty notes and homophobic, racist or sexist comments. Emotional/Psychological Bullying: Includes repeated stalking, threats or implied threats, unwanted email or text messaging, abusive websites, threatening gestures, manipulation, emotional blackmail, and threats to an individual’s reputation and sense of safety. Relational Bullying: Usually involves repeatedly ostracising others by leaving them out or convincing others to exclude or reject another individual or group, making up or spreading rumours, and sharing or threatening to share another’s personal information. Physical Bullying: Includes repetitive low-level hitting, kicking, pinching, pushing, tripping, ‘ganging up’, unwanted physical or sexual touching and damage to personal property. More serious violent behaviours are not necessarily treated as bullying and may be better managed through the College’s discipline processes. Cyber Bullying: Involves the use of information and communication technologies such as email, text messages, instant messaging, websites and social media to engage in the bullying of other individuals or groups. This technology can create additional means for verbal, relational and psychological forms of bullying. Bystanders: Bystanders are those who are aware of, or witnesses to, bullying but are not directly involved in bullying or being bullied themselves.